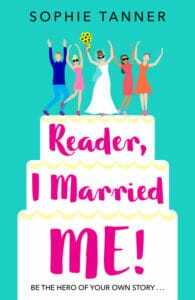 Reader, I Married Me is a light-hearted novel that offers an alternative to the traditional romcom narrative; it is due to be published in paperback in May 2019. About the book: Chloe Usher has just broken up with the love of her life. All her friends urge her to find another man before she disappears down the slippery slope to spinsterhood. After a particularly messy date and several gins, she decides that she doesn’t need an ‘other half’ to complete her and announces that she is going to marry herself. The news goes viral and, in the sober light of day, Chloe finds herself thrust firmly into the public eye, to the embarrassment of her friends and family. Planning her wedding solo takes Chloe on a bumpy journey of self-discovery, as she realises she needn’t wish away her life waiting for ‘the one’ when she is, in fact, the one! We are looking for book lovers to publish an honest review of this book on Amazon and, if they wish, on their own blog. The novel is out in paperback in May 2019 but we’d like to hear what professional bloggers think in advance of this date. If you are keen to take part, we will email you a digital copy of the book and can supply imagery and an author Q&A to support any blogpost you might want to write up. We’re looking for professional bloggers who write about books, lifestyle, mental health, psychology and relationships. We’d especially love to hear from you if are an avid reader and if you have an interest in self-love and self-care. The author is happy to provide supporting material for blogposts including imagery and Q&A.